Book your Niagara Falls tour today! 2-4 Day trips start at $108. Hotel and round-trip bus transportation included from NY or Boston. 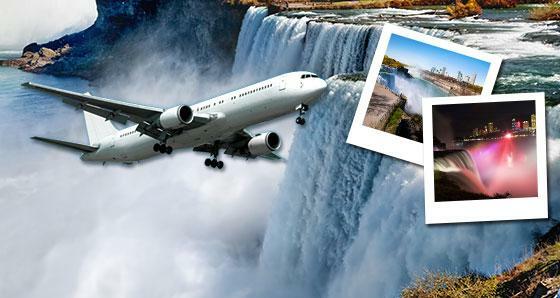 Fly round-trip for a Niagara Falls guided tour in a day! Enjoy a Maid of the Mist boat ride, the Journey Behind the Falls, and admire the Horseshoe Fall. 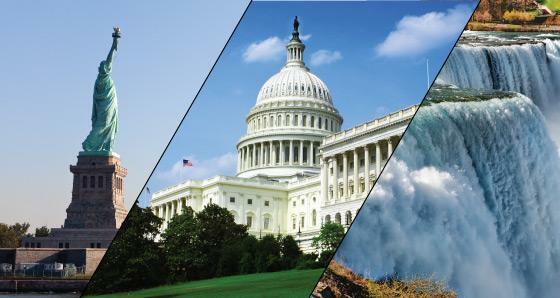 Discover the US East Coast and Niagara Falls with a multi-day tour package. Buy 2 get 2 free! The spectacular views and memories from one of our Niagara Falls tours or Day Trips will surely last a lifetime. Niagara Falls is actually made of up three falls, all found on the Niagara River which lies on the border of the United States and Canada: the Horseshoe Falls on the Canadian side and the American and Bridal Falls found on the US side. Our tours of Niagara Falls offer some of the most spectacular views of the falls you'll find short of going over them in a barrel! Niagara Falls is more than just three spectacular waterfalls. Copyright (c) 2011-2019 www.useastcoasttours.com. All Rights Reserved.